There is about 8.5 feet between the head of this bed, where I try to lay down and sleep and the toilet where… well, ya know. And the cool part? The exhaust fan is connected to the bathroom light meaning, if the fan stays on, the light stays on. On top of that, if you happen to close the bathroom door, with the bathroom fan/light on and the hotel room lights off, it looks like a poltergeist is trying to eek itself out. And let me tell ya, the poltergeist smells like it’s been dead for 4,501 years. Who thought this design through? Architects with Insomnia or Anosmia (the inability to perceive odor or a lack of functioning olfaction)? 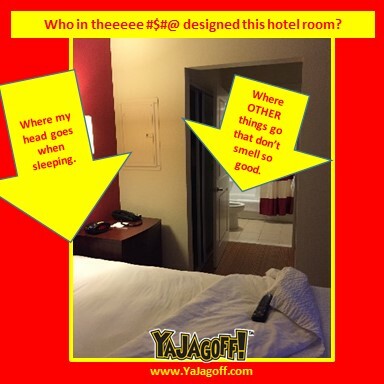 I’m thinking this was college buddies who developed this hotel room design… those same buddies that do their best to have the worst smelling gas around their friends. And, if you’re in a car with them, they turn the heater up and lock the electric windows! Hey Residence Inn, can we please get a non-poltergeist-scary-light exhaust fan design, or are we just gonna stay up all night and play a game of “who ate it,” Ya Jagoffs? Previous articleFor the 1,827,021th time, The Airport Rules!